Some houses remain inviolate for centuries. The Lives of Others is not more than a dozen years. There are times when demolition begins before completion. The main reason for this difference, as a rule, is the quality of the foundation. What to do if the building is already erected and eventually became visible signs of destruction of its base? 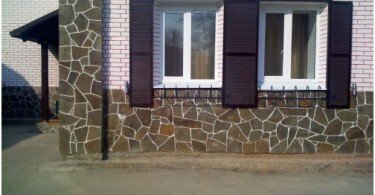 Repair of brick house foundation can be done in the home. To do this, initially you need to determine the reasons that caused this destruction. Among the reasons for the destruction of the foundation brickhomes are three basic - human activity, the shortcomings in the construction of the foundation and influence of natural factors. In the first case, in the operation structure of a person may be permitted soaking foundation tap water. In this ground and the base structure get slightly wet and freeze in the winter. Illiterate foundation design or poor-quality solution can also be causes of its destruction. The latter factor is manifested mainlyseasonal frost heave in which the building is to rise and fall in the winter in the warm season. And if the first and the second factor can be avoided, with the third, in any case, have to be considered, especially when it is a columnar foundation. 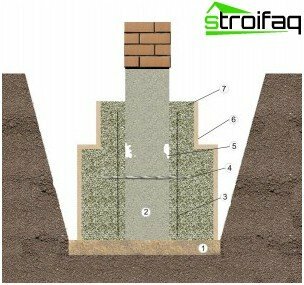 If substantial temperature differences, whichcharacteristic to our latitudes, as a consequence of swelling soils are cases when the external foundation for the season rises to 10 cm, while the inner remains in place. But it is much worse for buildings with any kind of foundation - building subsidence in the ground under its own weight. A clear indication that the foundation is something wrong, are the cracks and depressions at the base. 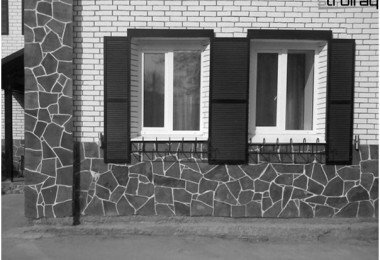 In the process of shrinking the foundation can give a crack,which will not progress and will require only minor repairs. It's enough to stick across the crack paper tape and watch its integrity for 10 days. If after this time the tape will be integrated in the crack is enough to shove the broken bricks and concreted. Otherwise, it becomes clear that the foundation will continue to resist the destruction, but because you need to come to grips with his recovery. Repairs foundation with his own hands It can be made to tape and onlycolumnar (pile) types. 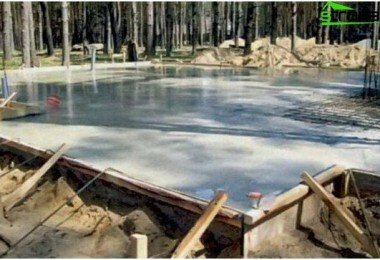 Repair of concrete and concrete structures require specific knowledge and skills, as well as the availability of special expensive construction equipment, and therefore to make it on their own are unlikely to be possible. Strengthening the foundations: and - a simple broadening of the foundation; b - the deepening and broadening of the foundation; -ushirenie foundation in reinforced concrete beams; g railway load transfer wall on the weight drilled (or knock-in) of the pile formed on both sides (g) on ​​the one hand or (d); e - load transfer from the weight of the walls on the monolithic concrete tides; g, h - reconstruction of strip foundation slab in the basement below the base (x), or in the level of pillows with keyway connections (h); 1 - a wall; 2 -usilivaemy foundation (foundation material in the figures is shown conditionally); 3 - reduces the load on the transverse beam (I-beam or channel); 4 - slot Picks for keyed engagement; 5 - reinforced concrete; 6 - reduces the load on the longitudinal beam (I-beam or channel); 7 - a bolt; 8 - reinforcing cage (as calculated); 9 -usilivayuschaya monolithic pillow; 10 - reinforcing concrete beams; 11 -buronabivnye piles; 12 -monolitnye reinforced tides (the beam); 13 - reinforcing the monolithic concrete slab. The basis of each of the foundation is postelistya rock. It was with him and begins planting and columnar, and tape foundations. With this type of fracture are trying as quickly as possible to stop the deposition. For this purpose, the cracks are exposed paper or plaster beacons in the form of tapes and indicate to them the date of installation. With the rapid shrinkage beacons burst within a few days. The next step - digging pit inclined (35 °) neartape or columnar foundation down to a depth of laying postelistogo stone. 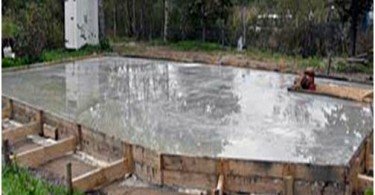 After that, the pit must be inserted asbestos cement or metal pipe with a diameter of 15-20 cm, and it means skinny pour cement or concrete mix, until the soil is completely satiate them. After this procedure, you must stop any work on one or two hours, and observe whether the soil to absorb excess solution. In case of withdrawal of the solution into the ground, resuming filling the pit after a few days. As a rule, the full soil saturationa solution it is necessary to repeat the procedure two or three times. Two days later, after the final stage of filling in the cracks beacons installed again. In the case of movement, it is necessary to continue filling the solution of the soil again. Monitoring the development of cracks: 1 - crack; 2 - Lighthouse (cement on the outside or on the inside walls of alabaster). If the position of the lighthouses has changed insignificantly proceed to the next step strengthen the foundation. Along the strip foundation or on the perimetercolumnar foundation piles must dig a ditch width of 20-35 cm. At the bottom and on the outer edge of the ditch are placed the board in a casing. 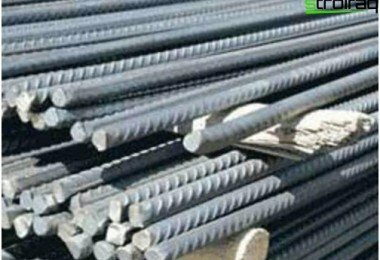 are driven metal studs between the bricks or stones of the foundation, which is attached to the metal mesh. It turns out a kind of armature, which is poured concrete solution filled with fine crushed stone and gravel. This design will help significantly enhance the carrying capacity of the corner of the house and distribute its load horizontally and thereby stop the deposition. Such a method is additional strengthening moresuitable for columnar foundations. 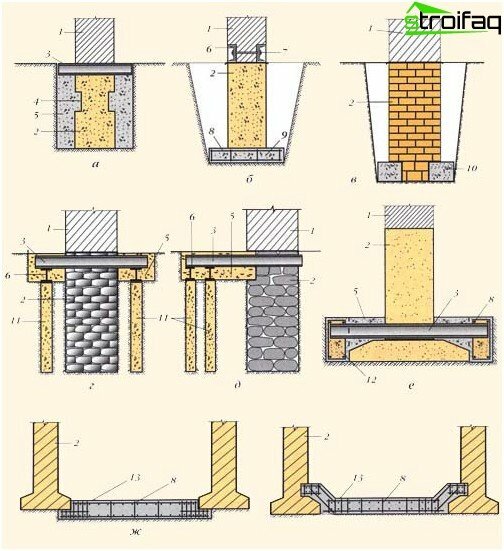 Thus consolidating two vertical piles, can be routed underneath a wooden or reinforced concrete pile in a horizontal position, which will increase the bearing capacity of the foundation of this is 2-3 times more. 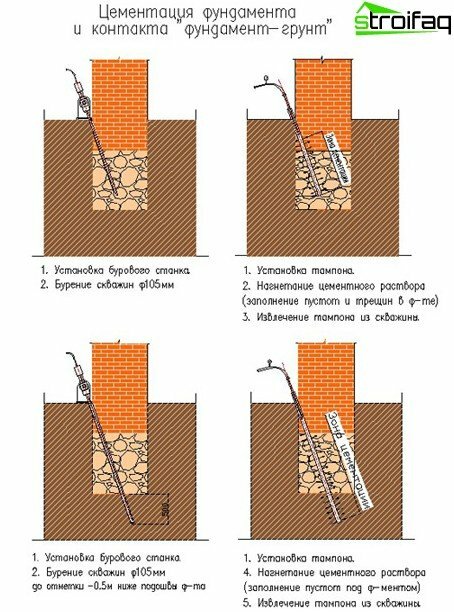 In the case of the appearance of cracks in basementside walls and skewing of one or more supporting structures, it is first necessary to determine the nature of the foundation destruction and choose the optimal method of amplification. If the foundation is indestructible around the perimeter due to load changes or high humidity, around the perimeter of the tape or columnar foundation piles must dig a trench. Then, you must thoroughly clean the surfacefrom the old plaster and mud, and at a certain distance from the wall to fix the metal mesh with anchors, previously driven into the base and foundation. It concreted structure, carefully ramming layers. Foundations made of rubble,reinforced concrete, rubble concrete and soil-concrete using concrete reinforcing cage broadened. 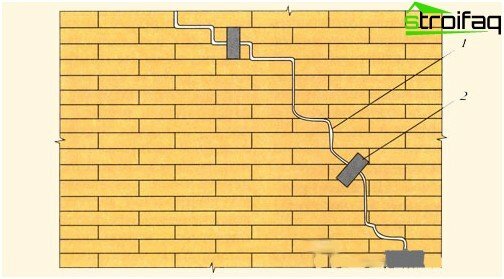 Its thoroughly using anchoring tie through the old masonry with the expectation that new areas of the foundation will be made to work together with the old part. Sometimes it is necessary to increase the load-bearing capacityfoundation in his weak areas. For this laid a new foundation along these parts of the foundation. In the future, it will take some of the load from the old foundation thanks to anchors that pass through it and are attached to metal and reinforced concrete piles passing through the basement of the building. In cases where the foundation comes into disrepairfully, we have to produce its replacement by a completely new. 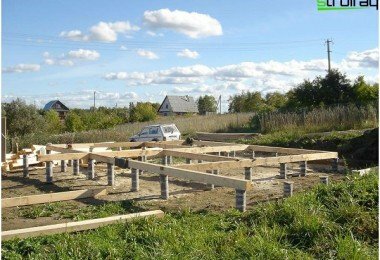 To do this, you must completely unload the old foundation and keep the stability of the house. There are several ways to do this. This can be done using the temporary wooden "chairs", positioning them perpendicular Lezhnyov foundation. The structure can be fixed also with stone pillars, which temporarily administered by the wall. They facilitate the transfer of load from the ceiling to the ground. You can also apply braces. They support the plinth wall and transfer the load from her to the ground at an angle. 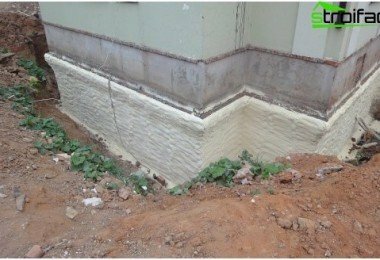 Before you begin foundation replacement, Must be installed on the wall beacons tonote possible deformation caused by the repair work. Only then can you begin excavation. The foundation should be laid out sites are not more than two meters long. During recesses of the foundation, the walls must bestrengthened with the help of braces. After this break in the foundation and purified plot them on the ground. The walls of the recess by means of reinforcing the boards with spacers in the form of formwork and start preparing a new foundation base. The sole of an old masonry is cleaned of rubble and soil. The dilapidated places her break. Old and new clutch "cross-linked" with a hard cement mortar and rubble. Only after the completion of the foundation to eyelinerone area, you can move on to the next. If you want to work on the device foundation can be carried out simultaneously in several areas. This is allowed to do in cases where the distance between the working areas is not less than 5.6 m.
In some cases it happens that all repairsworks that were carried out in order to strengthen the foundation, do not lead to the desired result. On the walls all as there are cracks, basement flooded with water, and the structure sags in the old and new locations. In this case you should decide to change the design of the foundation, which drags along the reconstruction of walls, floors, etc. Such unwanted consequences can be avoidedif recourse to specialist advice before starting work. Repairs can also hold their own. And here is some advice from the pros yet nobody has ever proved superfluous.